It was dark inside the room. Pitch-black, in fact. "Hello?" she called out from the doorway. "Is anyone in here?" Just as she was about to retrace her steps and go back to the reception, the room exploded with light. Alex had to hold her hand up to shield her eyes from the sudden brightness. When she was able to lower her arm again, she stared in shock at the sight before her. I chanced upon the fantasy, Akarnae when my school's librarian recommended it to me. I couldn't put this book down and though it's really long, I finished it in two nights! For anyone brave enough to believe in the impossible. Right from the beginning I knew this was going to be my type of book. This is definitely the best story I've read in a while and it is the first in a series. Everyone at Akarnae Academy has a gift and by that, I do not mean that some are smarter than others. Instead, they are special in a magic sort of way. Bear, one of Alex's friends, can charm anyone into doing almost anything and Jordan can turn invisible then walk through walls. Alex is desperate to have a power, too. I can connect with Alex really well even though she is much older than me. She has big attitude and to be honest, I am a little jealous of her experiences. I can only imagine how it would be to step into another world filled with such cool technology - where with virtual reality you can be inside a movie and menus can deliver food instantly if you press a small circle. There are even ComTCDs which are holographic chatting devices. I always enjoy unlikely heroines plus Akarnae is really funny. It's complicated, but in one part Alex has too much dillyberry juice and goes bonkers. She ends up singing very creative love songs to a doctor. When she finds herself in a hospital bed, Alex is mega embarrassed on hearing what she has done. Another favourite character is D.C., Alex's moody roommate. She mocks the main character but otherwise plain ignores her. Even though D.C. is cruel I like her because she holds a big secret. 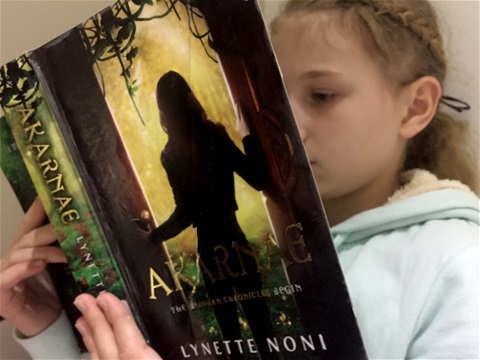 I recommend Akarnae to children aged 11+. There is not as much violence as there has been in other books I've reviewed, but this different. There is lots of hidden meaning and I got confused and had to reread parts. I also felt a little awkward during the flirty parts of this story; Alex is friends with two teenagers who keep bringing up how much they want to be her boyfriend. I give Akarnae five bookbolts out of five. The first novel was brilliant so why not read the second? I have now borrowed number two, Raelia.